Summary (from Goodreads, of course): It’s been so long since Auden slept at night. Ever since her parents’ divorce—or since the fighting started. Now she has the chance to spend a carefree summer with her dad and his new family in the charming beach town where they live. Review: I hesitated to read this book. 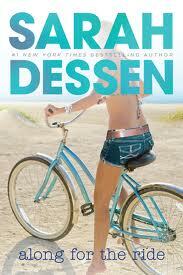 Yes, Sarah Dessen is one of my favorite authors but I hadn’t connected with the last one I had read as much as all of the others. I was afraid that I had out grown her work, so I just didn’t try. Boy am I glad I gave in! I loved this book from the beginning. Sarah brings her characters to life within the first few pages. She has a way of letting you get to know them, seemingly intimately, within the first chapters. I also experience the feeling of growing as I read her books and this one did not disappoint. She is an amazing writer, and after ten books, she still knows how girls feel at a certain age and has a wonderful grasp on the family dynamic.